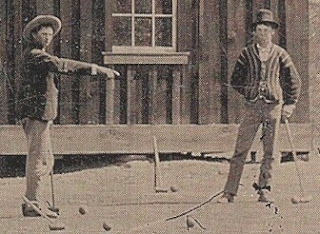 Heroes, Heroines, and History: Croquet in the Wild West? Croquet in the Wild West? Sorry, Janet, but Croquet is the nearest thing to golf I'll ever get. 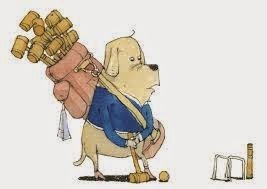 Janet Chester Bly wrote a HH&H blog "A Little Golf Lesson" - http://www.hhhistory.com/2014/07/a-little-golf-lesson.html and I gave some serious thought to learning the game. On our ranch, we have rolling hills, water hazards, trees and thickets, sand traps, and gopher holes. What more could a golfer want? However, I decided that if I was going to knock a ball around a few acres, I wanted to go big or go home. Croquet would have to be my game. As kids, we tried to play croquet in the sandy front yard of our southeast New Mexico home, but it was a battle more than a game. The balls bogged down in the sand and the mallet strikes sent the dirt flying in all directions along with the hoops. That was the first time I dreamed about having a real grass-covered lawn; one set aside specifically for Croquet. We used a simple field pattern that came with the game until my brother made some more hoops (wickets) out of mother's wire coat hangers. The game really got wild then. 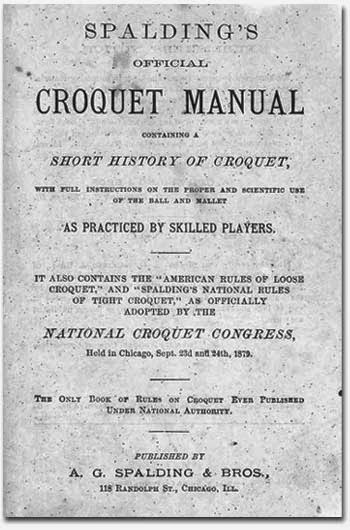 I remember seeing a couple of Croquet sets in the high school gym, but never saw anyone playing. A few years after I graduated, the game became really popular on both the east and west coasts. 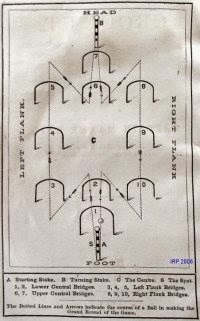 The game became more sophisticated with colored wickets to help chart the course and different shot techniques. Years ago, I was told that Billy the Kid played croquet in the Capitan Mountain of the New Mexico Territory. Would Billy really chase a ball around yard with a mallet? I doubted that since it was pictured as an eastern garden party game to encourage women to "get outside in the sunshine." 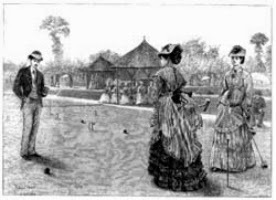 Croquet is still considered to be one of the few outdoor sports in which women can complete on an equal footing with men. 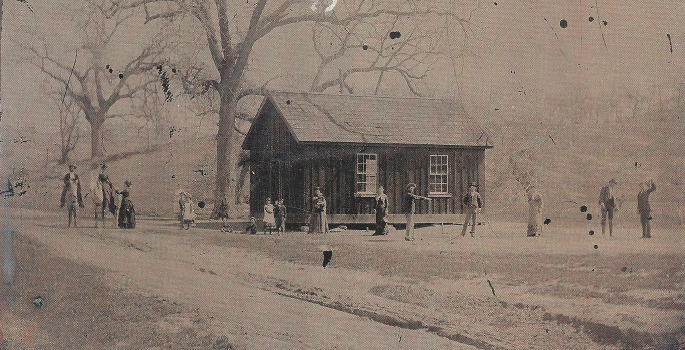 In April, 2015, Wild West magazine backed up that claim with a Circa-1880 tintype of William Henry McCarty (Bonney, Antrim) a.k.a Billy the Kid holding a croquet mallet. The first picture is of Tom O'Folliard (left) and Billy. The second picture is the total setting of the isolated photo. Randy Guijarro of Fresno, California, is the owner of the tintype. The WW article states that tintypes are mirror images, so Billy is actually holding the mallet in his right hand, not his left. Croquet goes back as far as the 1300's. It's thought to have been an in-door type of lawn-bowling for inclement weather or confined spaces. It was moved outside in better weather. In medieval France, Croquet was called "Paille-maille." 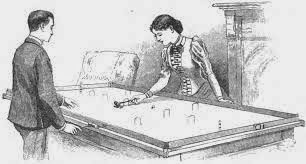 It's reported that a French doctor changed the rules, called the game Croquet after the crooked stick used to hit balls through wickets, and recommended it for the health of his patients. It's called Crooky in Ireland. 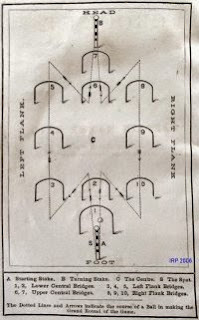 The game came to North America in the early 1860s and was introduced in the 1900 Paris games as an Olympic sport. 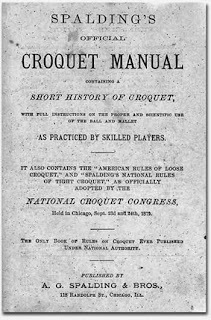 In the USA, three forms of the game are played, American Six Wicket Croquet, American Nine Wicket Croquet, and International Association Croquet. 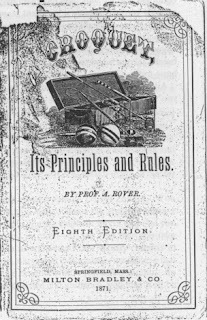 Many well-known companies such as Milton Bradley and A. G. Spalding & Bros. published rule handbooks and manuals. That's very appealing today because of the multiple days of rain and mud. 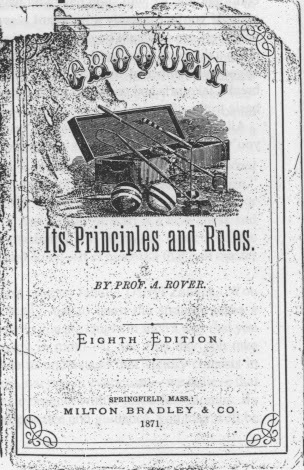 During my research, I found Golf Croquet, a greatly simplified version of Association Croquet, which has a large following in many countries. Maybe I'm going to be into golf after all. 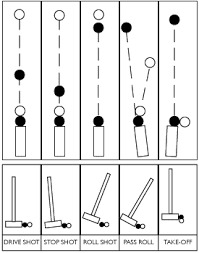 Find out more about Golf Croquet Rules for Toequet and Malletball at http://www.toequet.com/rules.html. There are many variations of Croquet — Xtreme Malletball, Toequet, Pirates, Guerilla, Malletball, Poison, and Wicket — apparently something for everyone. Are you a Croquet player? Have you given your children/grandchildren their own mini-set? Lin and her husband live a ranch in Chimney Rock, Colorado. She writes historical fiction for adults and children. 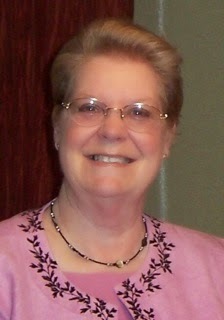 Her enjoyment of genealogy and family history adds unique elements to her stories. My brothers and I had such fun playing croquet. I actually had the original set we used until recently. Downsizing causes some memories to be sold. Hi Martha, so good to hear from you. Downsizing causes tough decisions. I hope the folks who received the set have years of enjoyment and fun, too. Hi Lin, what an interesting post! 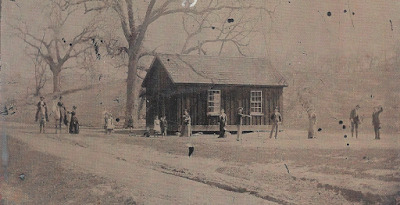 I played croquet many years ago, (but not with Billy the KId). Recently I had the opportunity to go to a Crate and Barrel store for the first time. 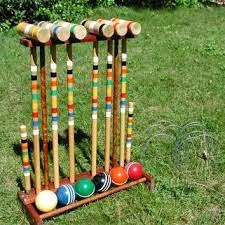 When I saw a croquet set, I was tempted to buy it thinking it would be a fun game to teach the grandkids. But the $150 price tage changed my mind. Hi Marilyn, thank you. Wow - $150! I can remember when it was the most inexpensive yard game set you could buy, even though it was solid wood. Hope you find a more economical set - the grandkids will love it. Hi Lin, people would be surprised if they knew that those old cowboys did in their spare time. Some probably even played Tiddledy-Winks. I play croquet with the grandkiddies but always lose. I'm not that great at Tiddledy-Winks, either.. Golf? Forget about it. Hi Margaret, thanks for stopping by. I've been looking for other "games" cowboys played. So far, all the cowboys I know around here won't admit to anything that doesn't involve horses and ropes. I've never played Tiddledy-Winks. I'll have to try that. Golf is definitely off the table. Hi, Sharon, glad to see you again. I tried that stroke once and only once. I missed the ball and hit my foot. That's when I discovered my depth perception isn't the best! I can imagine the great times your family has had over the years. You're welcome, Anita. It was fun talking to my sister about the games we played as children.